Last night, as the snow came down in soft swirling flakes, I sat on the couch with a cup of tea, watching the cars as they spun their tires trying to go up our hill (and inevitably slide back down). As bad as I felt for those drivers (and I did), I couldn’t help but feel grateful to be tucked up in my house, warm and safe and with no where to go. Eventually the snow plough came along, salt spraying out the back, and tamed the snow enough for traffic to pass by safely again. But it got me thinking about what a wonderful time of year this is to concentrate on the slower things. The holidays are over, the busy-ness of spring is still a long way off, and everything feels a little like it’s in limbo. 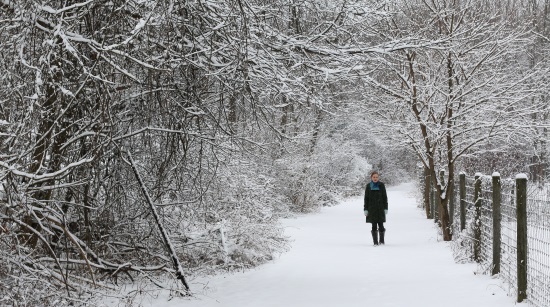 What a perfect opportunity to spend a little quiet time at home, focusing on all those warm and woolly pursuits that make us feel grounded and safe while it’s cold and snowy outside. Although I always think of January as Selfish Knitting Month, I love the term “hiberknitting” too! Loveknitting.com created this fun quiz to see what type of hiberknitting animal you are. I’m a dormouse — what did you get? Nothing to do with knitting or crochet at all but I think I need one of these. I mean, I have a full-sized dishwasher in the kitchen but still… I need one! 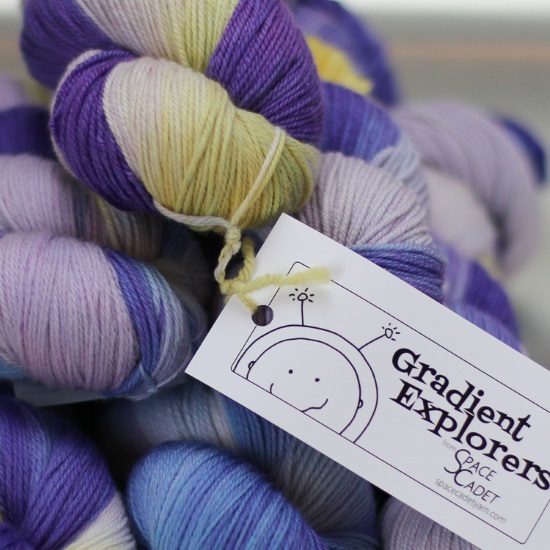 You’ve seen the latest colourway for the Gradient Explorers and it takes the ever-growing gradient in a whole new direction that the whole team is just swooning over. We open spaces to the Gradient Explorers only when they become available and we have a few spots open at the end of this month so mark your calendar for Friday Jan 26 at noon. It’s sweater weather time! 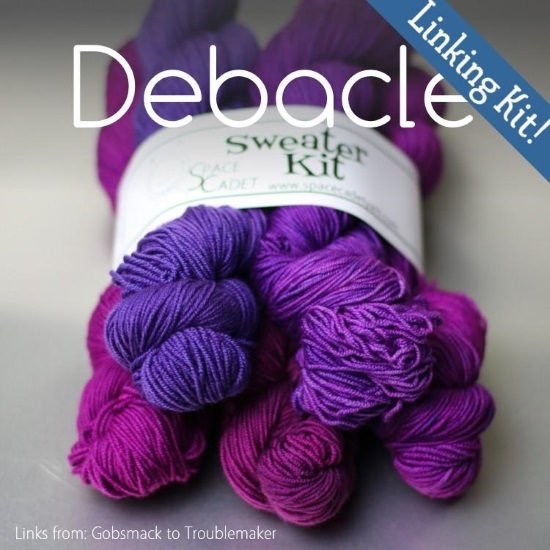 And we do some seriously gorgeous Sweater Sets in gradients that link from one of our regular colourways to another (so it’s dead easy to add extra skeins if you need them!). But we’re low on stock so we are dyeing more this month for a shop update on Feb 2. Set a reminder on your phone! 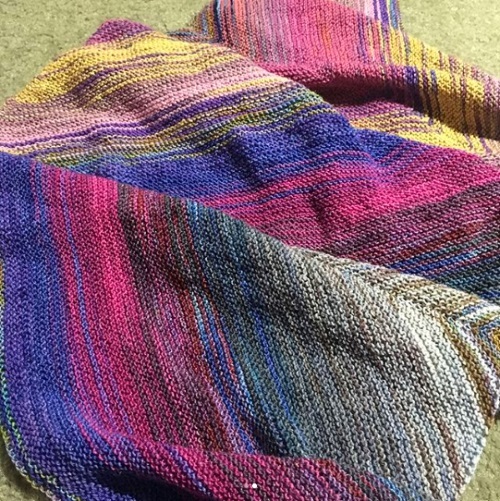 Andrea knit her Adventurous Wrap with SpaceCadet Mini-Skeins and I love how it came out. Talk about living up to the pattern name! Rebecca made these two beautiful hats by striping the colourways from our October SpaceMonster Club parcel, and I think they look terrific! She’s made two more as well, and all four are different from the others. Click here to see them and show her beautiful knitting some love! Ok, that’s it for today. I’ve finished my tea and it’s time I got down to the studio — we’re going to work on some of those new colourways we were playing with last week (keep an eye on my Instagram for process pics!). I hope you have a wonderful day ahead of you too and, until next time, all my best! 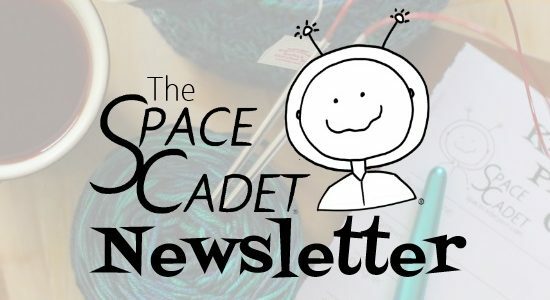 SpaceCadet Newsletter: Knitting a Shawl a Day?